Our heel bone, or calcaneus, is the largest and strongest bone in our foot. The heel bone is the first part of our body to touch the ground and acts as the initial shock absorber with each step we take. The faster we walk or run, the greater the shock the heel has to absorb. Heel spurs can appear at the back of the heel (posterior calcaneal) or beneath the heel under the sole of the foot (plantar calcaneal). They are abnormal growths of bone caused by the plantar fascia or Achilles tendon pulling away from the calcaneus. Heel spurs can be seen in a variety of foot types, from high arches to flat feet. Most heel spurs are asymptomatic and are discovered only as a coincidental X-ray finding. The heel spur itself becomes painful when it enlarges and becomes more prominent. Unfortunately, the pain associated with heel spurs can be disabling, especially when standing or walking. Intense pain, especially when the weight is applied to the entire heel after a period of rest. 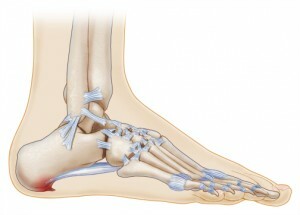 This pain is localized initially, but eventually spreads to the entire heel and/or arch. How Did I Get Heel Spurs? One can imagine the heel bone to be in a constant state of “tug of war” between the plantar fascia attached to the bottom and the Achilles tendon at the back. Your doctor will order an X-ray, which will reveal a ledge of bone extending from the bottom of the heel (plantar heel spur) and pointing downward, towards the toes. It is said to look like a tooth penetrating the flesh. Many people misunderstand the difference between Heel Spur Syndrome and heel pain due to spurs. As discussed before, heel spurs are generally not painful unless they become too prominent. In the case of Heel Spur Syndrome, when the plantar fascia can stretch no further and the heel spur can grow no more, an inflammatory reaction occurs involving both of those structures. This tends to be the most common mechanism for the development of plantar fasciitis. The heel spur itself may cause few or no symptoms. In this case, the heel spur is simply an indicator of the problem. If conservative methods fail, or your condition is severe, surgery may be required. The surgery performed addresses only the heel spur in cases where it is found to be the cause of symptoms. Heel spur surgery usually requires general or IV anesthesia. An incision is made on the site of the heel spur, and once it is uncovered, the spur is resected. Surgery is usually performed on an outpatient basis, and requires the patient not to put weight on the heel while recovering, possibly in a cast. The post-operative course is dependent on your required activity level and the extent of the spur. The more standing, walking, and lifting your job requires, the more time off work will be necessary. Complications of surgery can include nerve entrapment, infection, painful scars, and possibly recurrence of the heel problem. How Can I Prevent Heel Spurs From Developing? Why is it necessary to prevent heel spurs? Left untreated, heel spur pain can reduce your normal level of activity and cause changes in gait, which may be permanent. Always do stretching before and after exercise. Perform plantar fascial stretches on a daily basis. Avoid walking barefoot inside or out. Avoid high-impact activities on hard surfaces. Wear your orthotics as much as possible. Losing excessive weight will reduce stress on your feet. Pay attention to your feet. If they hurt, they’re trying to tell you something. Have them checked out by your podiatrist or primary care physician. How likely is it that my heel spurs will return? Based on my condition, which treatment would benefit me most? How long will it be before I can return to work and daily activities? Where is my heel spur located? After treatment begins, what symptoms should I watch for that would indicate treatment is not working? Can I make an appointment to bring in a few pairs of shoes I wear on a regular basis to see if they fit properly and offer enough support? Which orthotics will help reduce the symptoms of heel spurs?